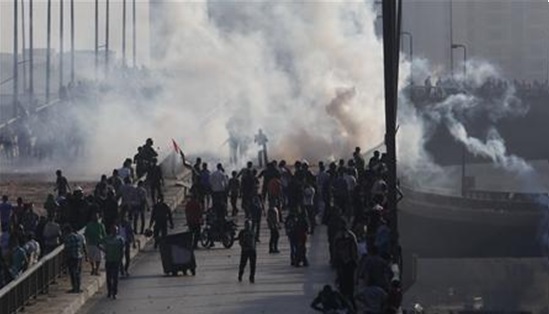 Violence continues to rage in Cairo, Egypt more than a month after Mohamed Morsi was ousted from presidency by the Egyptian armed forces. 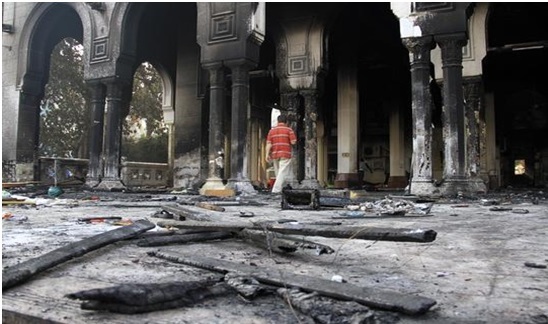 Today, the violence reached a new level with several buildings being burned amidst protests by pro-Morsi protesters. Wednesday almost 640 people killed in protests and clashes across the country with 43 being police forces according to the Health Ministry. On top of that, almost 4,000 people were injured. The bulk of the deaths happened during security and pro-Morsi clashes when security destroyed two protester camps in Cairo. Of the 638 people killed, 288 occurred in the Nasr City district of the capital. According to interim Interior Minister Mohammed Ibrahim, after security forces advanced on the camps, fights erupted all over Egypt. Collateral damage included government buildings, blocked roads, Christian churches burned, and police stations being attacked. A State Information Service announcement explained the situation while standing by the government’s decision to use force. “The security agencies were keen to adopt a gradual plan to avoid bloodshed and falling of victims.” The statement also mentioned that the police tried to get people to leave the camps and even offered a safe exit, but had to resort to using tear gas. Today, protesters attacked more structures including an administrative building that housed Giza’s local government—where one of the camps is located. The Interior Ministry gave the go ahead for deadly force to defend the structure. The government issued a statement blaming the Muslim Brotherhood. Economic institutions, museums, and dig sites all closed its doors while the clashes continue due to safety concerns. The government said that most of the country is in a state of emergency for the month and that there will be curfews enforced. The U.S Embassy located in Cairo has also been closed to the public. The State Department issued warnings about the conditions in Egypt and advised Americans in the country to leave and avoid arriving there. President Obama weighed in on the situation and condemned the actions. He went on to say that condemned the violence and said the Egyptian government’s best step would be to do away with the state of emergency and get into the election stage as soon as possible. He also announced that next month’s joint military operations would be cancelled. Ahram Online, a news vehicle in the area, reported that some members of the interim government— Deputy Prime Ministers Ziad Bahaa El-Din and Hossam Eissa—will be leaving their positions. Disagreeing with the assaults on protesters, Vice President Mohamed ElBaradei resigned Wednesday. The group known as Tamarod—which organized the anti-Morsi protests prior to the ouster—said that ElBaradei was shirking his duties to the country. Since early July, the Muslim Brotherhood’s leadership has been arrested on charges of instigating violence and for having a hand in the killing of protesters—at the security force’s hand. Some 200 protesters have also been arrested. Morsi himself has been under house arrest and his imprisonment extended. It was later revealed that Mohamed Morsi is being because of 2011 escape from Wadi Natroun during former president Hosni Mubarak’s administration. The issuing judge, Hassan Samir, said that Morsi conspired with Hamas in the escape. More protests are expected in the coming days and with those protests, more violence as any chances of peaceful resolution are non-existent at the moment.